With eggs, of course! We’re talking soft, comforting eggs nestled in creamy, dreamy grits with bits of crispy Bacon swirled all inside. One spoonful and whatever was driving you out of your mind will magically melt away, and all that will be left is breakfast for dinner happiness. 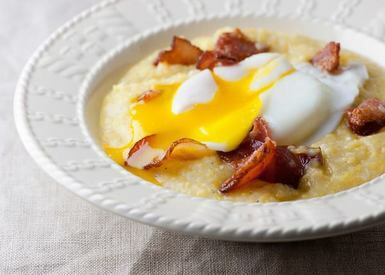 That’s all it takes…one bowl of eggs with creamy Bacon grits.